Bathroom mirrors are more than just tools for applying makeup and achieving the perfect shave. They’re also one of the room’s primary focal points, and when carefully chosen to complement the room’s style, can make or break the overall aesthetic. 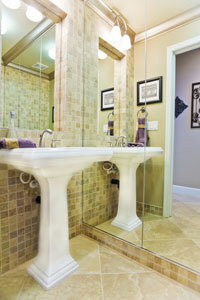 Yet, even the perfect bathroom mirror can negatively affect a room’s décor if it’s poorly installed. To ensure that your mirror enhances the design of your bathroom, turn to a home improvement company that can not only help you choose the ideal mirror, but can also install it with incredible attention to detail. For many homeowners in TN, SC, IN, OK, and surrounding states, that company is 31-W Insulation. No matter which of Gardner’s mirrors you choose, you can rest assured that it will be impeccably installed by the professionals at 31-W Insulation. We’ve served countless homeowners since our company’s founding in 1972, which has given us ample time to perfect our craft. Discover for yourself why so many homeowners in Tennessee, South Carolina, Indiana, Oklahoma, and surrounding states have turned to us for their home improvement needs. Contact us today to learn more about Gardner’s bathroom mirrors and to schedule a complimentary consultation with our friendly team. Don’t forget to ask about our other services, including the installation of gutters, foam insulation, custom closet organizers, and more.